In the summer “Pro” column: school’s out, so we can take fun trips to BIG places. In the “Con” column: school’s out, and having two kids at home leaves little time to blog about it! We’re just back from almost three weeks in central Florida, and we made tracks across that state, let me tell you. We’ll be sharing the details in future posts, but our trip included visits to: the world’s largest manmade penguin colony; the world’s largest LEGOLAND; the world’s largest Hard Rock Café; the world’s largest collection of personal astronaut mementos and historic spacecraft; and the world’s largest accredited sanctuary for big cats! 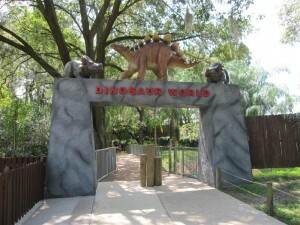 But our first stop was to Dinosaur World, the world’s largest dinosaur attraction. I’ve seen the giant T-Rex menacingly stalking the I-4 highway many times on the drive between Tampa and Orlando, and have always wanted to stop in. Actually, this is just one of more than 150 life-sized dinosaurs you’ll see as you take the paved – and gloriously shaded – “Dinosaur Walk” through a forest setting. 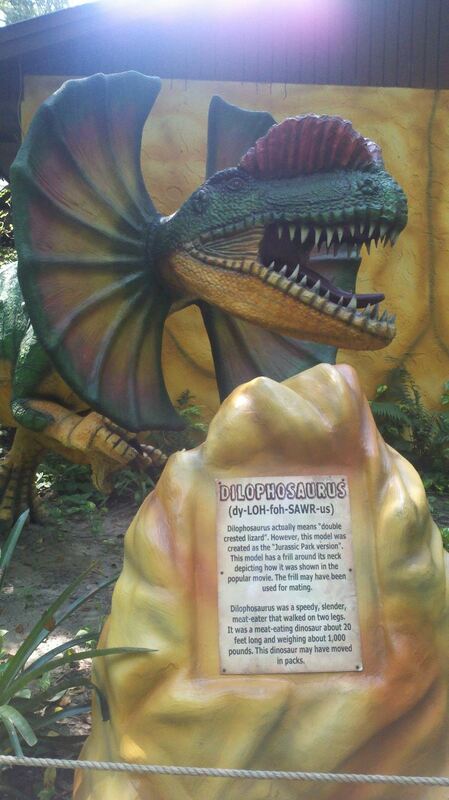 Fact-filled signs near each creature provide paleontology lessons along the way. The dinosaur models, up to eighty feet long, are made of fiberglass, steel, and concrete. 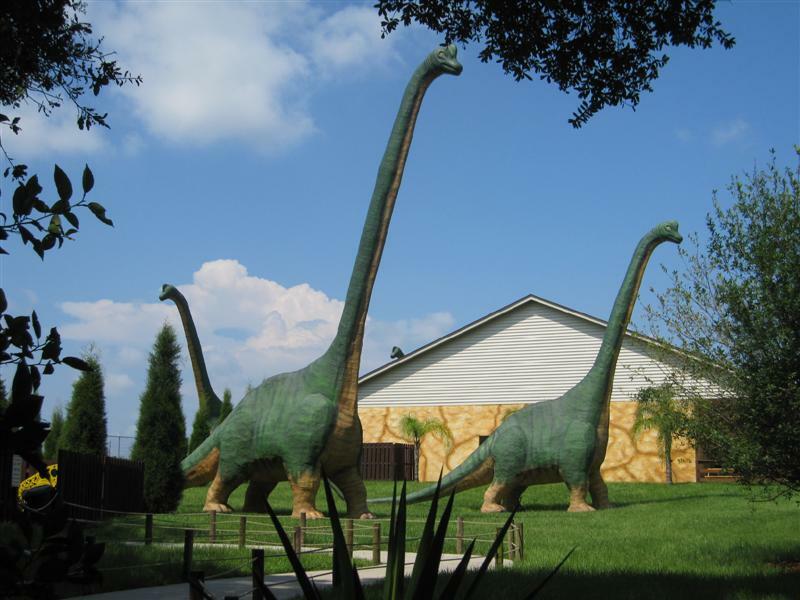 These Brachiosaurus can also be seen from the I-4 highway. Which could be startling at night if you’re not expecting them! Dinosaurs are becoming a “thing” for us. Makes sense…they’re BIG after all! 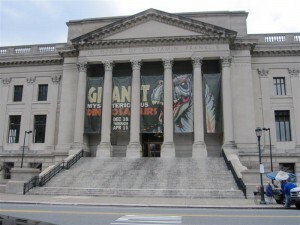 Last year, we went to the American Museum of Natural History in NYC for its temporary exhibit, “The World’s Largest Dinosaurs.” This spring, the Franklin Institute in Philadelphia is presenting a similar program, “Giant Mysterious Dinosaurs,” through April 15. 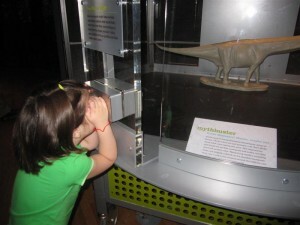 Visiting Philly earlier this month, we were drawn to The Franklin Institute for this dinosaur exhibit, as well as the giant walk-through heart. In the end, another unexpected BIG thing turned out to be the highlight of our visit. We would have loved this place more if we had: A) less whiny children; and B) a few more hours to cover all three floors of science and technology exhibits. We missed out on the planetarium, IMAX theater and 4D flight simulator. Last week, on our post about the Jurassic dinosaur collection at the Carnegie Museum of Natural History, I mentioned DinoMite Days, a 2004 public art project which resulted in 100 uniquely decorated dinosaurs, made of fiberglass and weighing 200 lbs each. They were temporarily installed throughout the city, but most have since been sold to private collectors. However, several can still be found on public display. We found these BIG beauties in front the “Wintergarden” building at PPG Place! Measuring up to 90 feet, the Diplodocus was one of the longest animals ever to walk the earth. Dinos rule. The Girl knows this. She likes her animals fierce. She also appreciates a take-no-prisoners approach in plant life — her favorite is the Venus Flytrap. I’m not worried. As we found out on our recent road trip, Pittsburgh is dinosaur country. 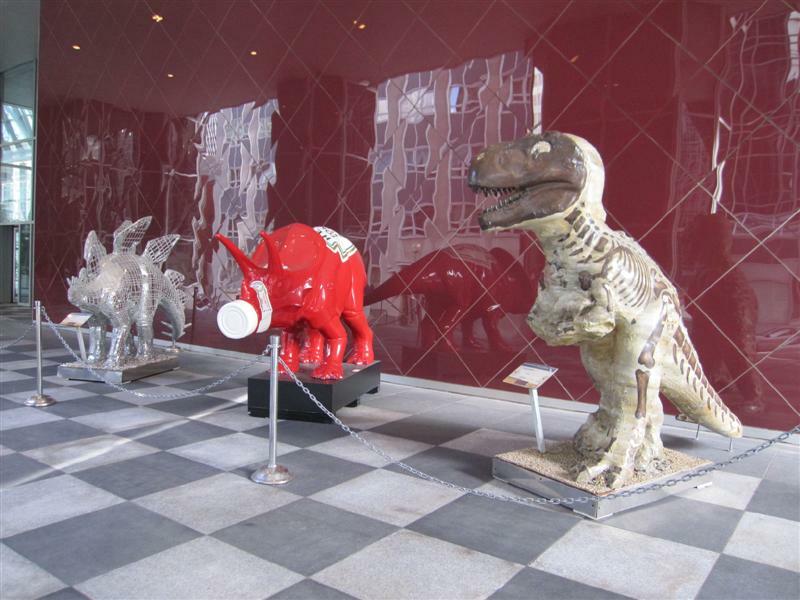 In 2004, a public art project called DinoMite Days commissioned artists to create 100 uniquely decorated fiberglass dinosaurs, which were installed throughout the city. We discovered several which remain on public display. For the real dinosaur deal however, we knew we had to go to the Carnegie Museum of Natural History, home to the world’s largest collection of Jurassic dinosaurs. Look who we ran into this weekend! 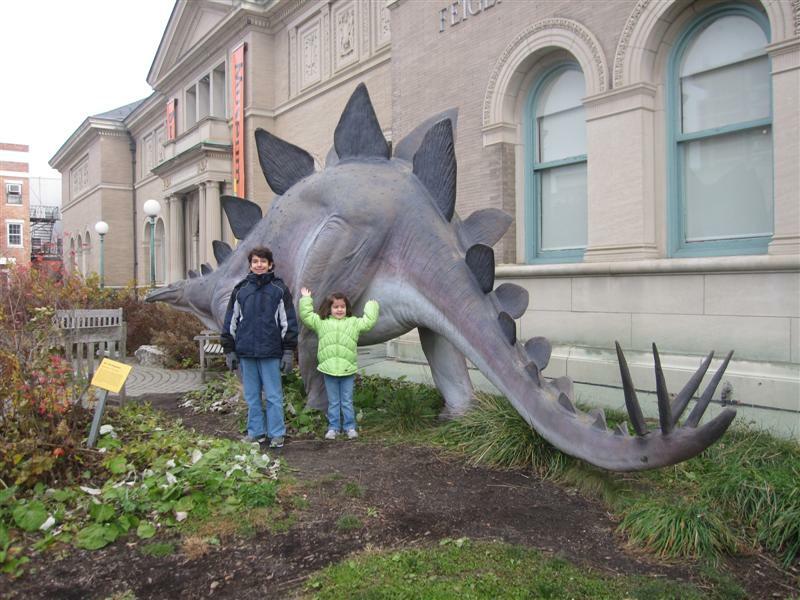 This BIG stegosaurus sits in front of the Berkshire Museum in Pittsfield, MA. We were in the Berkshires for a reunion for the PR company where Matt and I both worked – and met – way back in the Jurassic Period. Speaking of the Jurassic Period…this is Wally the Stegosaurus, so named because this creature’s brain was the size of a walnut. A life-size replica, he’s 26 feet long, 12 feet tall, and 7 feet wide. Since he’s made of fiberglass, he only weighs 1,200 lbs, versus a real Stegosaurus weight of 6,000 lbs. 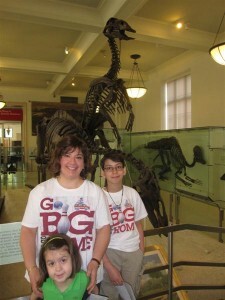 We were invited to attend a bloggers’ “social” last month at the American Museum of Natural History in New York City. 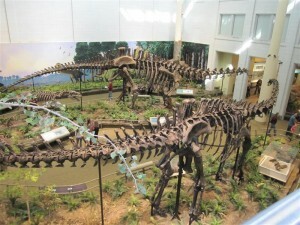 Specifically, to visit the new exhibit, The World’s Largest Dinosaurs. 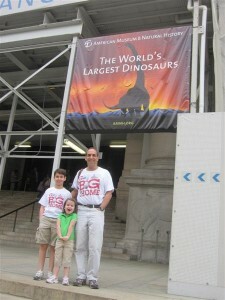 Because we love all “world’s largest” things, even extinct ones! 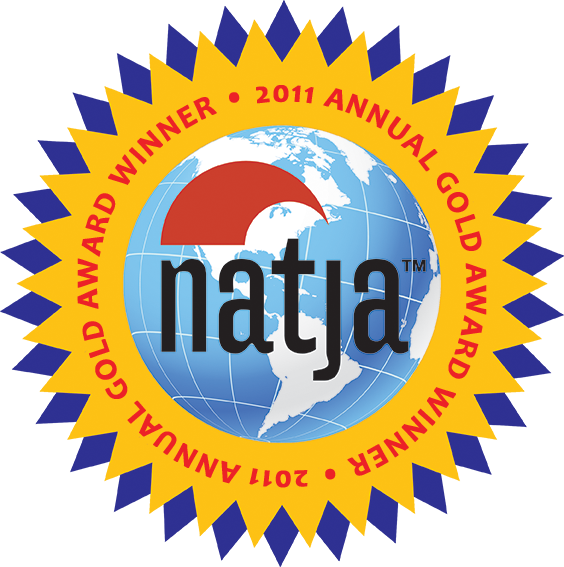 The exhibit is only open through January 2012. 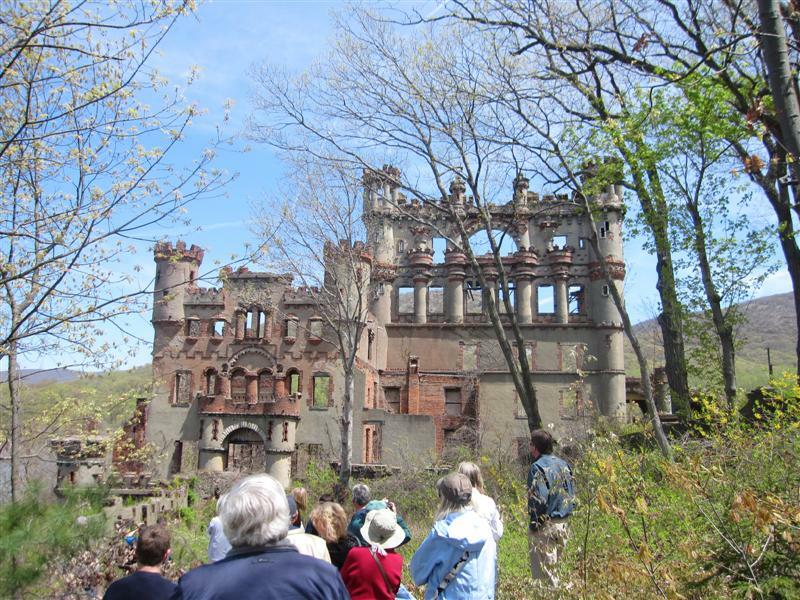 We wanted to get there as soon as possible, share it with you, and convince you to visit! And because The Girl is going through a dinosaur phase. She’s been playing with The Boy’s old plastic dinos, setting up social “meet and greets” with her Strawberry Shortcakes figurines. 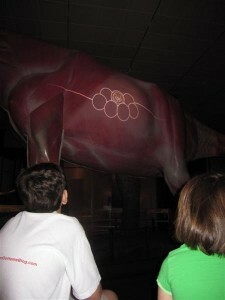 We found this to be one of the most hands-on of all exhibits at the AMNH. The lesson here is how dinosaurs actually lived, by revealing their biology. This exhibit focuses on the largest group of dinosaurs which ever lived, the long-necked and long-tailed sauropods, which ranged in length from 15 to 150 feet. In the middle of the exhibit space is one type of sauropod, the Mamenchisaurus, which was 13 tons and 60 feet long. Thirty of those feet made up the length of her neck. Nearly life-size, this creature doubles as a projection screen. When you sit on the semi-circular bleachers facing her side, you can watch the video presentation displayed on her body, which describes how their bones, muscles, and internal organs worked. You can feel the vibrations of the show through the seats, which added a fun, dimensional experience. One of the topics covered is their digestive system. You’ll see her neck light up as you follow the trail of the plant life she would eat. Sauropods would have to eat 10,000 calories a day. We learned that, despite their long necks, they would prefer to eat low-lying foliage, because raising their long necks would put a strain on their hearts and make it hard work to reach for higher branches. 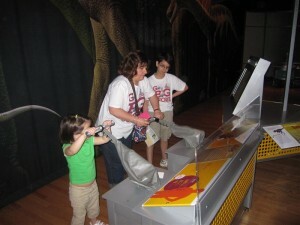 In fact, one exhibit involved pumping levers simulating the heartbeats of different sized animals to compare the strain. 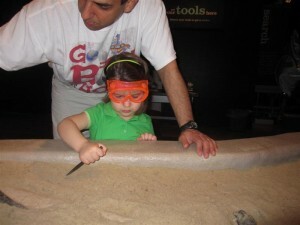 But The Girl’s favorite was the fossil dig in a giant sand box. Mainly because she got to wear the pink goggles. This exhibit leads into the Museum’s series of fossil halls. The Museum is home to the world’s largest collection of vertebrate fossils, totaling nearly one million specimens. More than 600 are on view, and most of them are real specimens, not casts. Dinosaurs’ life spans increased with size. Sauropods would live to about 60, while in comparison, a tiny shrew lives only one to three years. While most creatures have roughly the same number of heartbeats over the course of their life – 1.5 billion – small creatures have faster heartbeats, and they use them up faster! We don’t really know what color the sauropods actually were. They’re depicted as green and brown, but all we know for sure is that they had scales. A fun view-finder exhibit showed them with different colors and patterns. The largest sauropod, the Argentinosaurus, weighed nine tons — ten times more than any known land mammal. These giants rank among Earth’s great success stories, roaming the planet for 140 million years. This video on the AMNH site goes behind the scenes with The World’s Largest Dinosaurs curators, as they explain the science behind the exhibition. On the other end of the intelligence spectrum, we made this video of the kids — outrunning a dinosaur in a taxi — at a kiosk in the Fossil Hall. Hams, my family is full of hams. 9. Such a great exhibit…such a fantastic museum!